If you have crossed the 40’s and entering the menopause stage, you have to know that there are alternatives to control your weight and not increase pounds. What is diet during menopause? With the diet for the overweight in menopause you can avoid its effects and consequences. Through the selection of foods for obesity after age 40, you will lose weight in a healthy way. 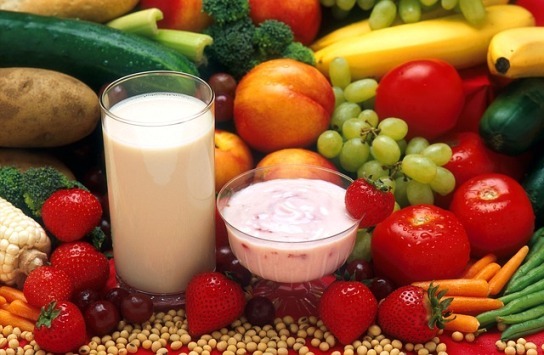 The diet for the overweight in menopause is based on a special selection of food, which will take into account not only the low calorie foods, but also food that provide minerals such as calcium and vitamins A and D, essential to prevent osteoporosis, a disease that causes bones to become weak. Milk: Dehydrated, if you have the possibility choose a fortified milk with calcium. Milk naturally contains this mineral, but there are milks to which calcium is added moreover. Every day you should drink at least two glasses of milk or replace it with nonfat yogurt. Cheese: Low-fat. Every day you should consume a piece of cheese, either firm or spreadable pasta. Egg: 3 whole units per week. You can consume the egg every day. The yolk can be consumed 3 times a week. Meat: Consume fish (3 times per week), chicken (2 times per week) or lean beef (twice a week). No cold meats or sausages. Vegetables: You can consume all vegetables, I advise the ones that have the most calcium: broccoli, turnip, spinach, cabbage. Also carrots, all green leafy vegetables, tomatoes, or any other vegetable you like. Only consumes potatoes, sweet potatoes and corn with a frequency of once a week. Fruits: All, preferably raw. If you drink grapes, strawberries, raspberries, cherries or any other small fruit, measure with a cup. The banana and avocado can consume with a frequency of once a week. Legumes: These are a very good source of calcium, soybeans, beans and chickpeas. You can also consume lentils. You can replace the vegetables with a meat dish. Cereals: Preferably whole, rice, pasta, flour. Consume a daily portion. Bread: Whole. 2 slices per day. Oil: from sunflower, grape, soy, corn or olive. Avoid mixing oils and butters. Only use the oil to season. Avoid fried foods. Drinks: Preferably mineral water, you should take two liters of water daily. Avoid soft drinks or sodas for the gas it contains. Avoid alcoholic beverages because it fixes the fats. Fruit juices and vegetable juices are allowed. Sugar: Replace with artificial or natural sweeteners such as sucralose. The portions should be small plates, better eat little several times a day, much rarely. Drink plenty of fluids, it will help you to purify your body. Perform daily physical activity, walk daily for 30 minutes, and perform three times a week exercises localized to lower the belly and strengthen buttocks. This way you can lose kilos and avoid sagging in those areas that both bother you. Do not forget to go to your doctor, he will help you to go through this stage so special for you.